Meatspace, the second novel from Nikesh Shukla, is out now on The Friday Project. Kitab Balasubramanyam is having a pretty rough few months. His girlfriend left him, after deciding he drained the joy from life through never being fully present in the room without social networking. His debut novel didn't sell any copies and so he's now burning through his inheritance money. The few people that did notice his book won't stop emphasizing the Indian in 'Indian novelist'. His father has more success with women than he does AND his Facebook comments get more likes. He's reduced to spending all of his time coming up with ideas for novelty Tumblrs in his flat with Aziz, and now even he's left for adventures in New York in an attempt to jazz up his blog. When Kitab's namesake arrives from India, looking for someone to take him under his wing, and claiming to be 'the real Kitab', he's forced to deal with a increasingly absurd sequence of events to try and get his life back. But what does that even mean anymore? 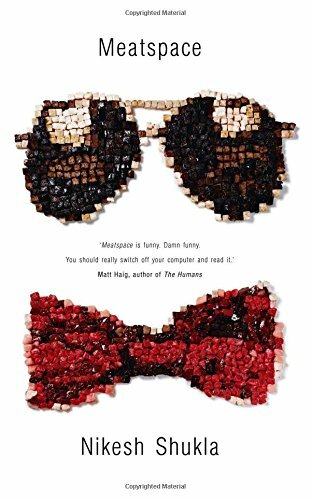 Meatspace is a hilarious and troubling analysis of what happens when our lives become an aggregation of shared content.